Voila, the list of top Christmas gifts for boys for 2012, as predicted by the UK Toy Retailers Association and the British Toy and Hobby Association. It's a mix of modern favourites and retro classic, from Ben Tenand Nerf to Star Wars via Hot Wheels and Spiderman. 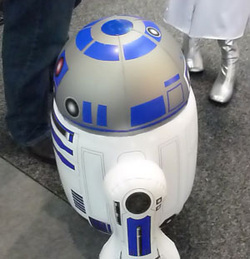 Star Wars is still incredibly popular, and although it's not on teh offical list, we reckon any kid lucky enough to receive an RC Inflatable R2D2 that we saw demo'd at the London Toy Fair in January 2012 will have to fight off their Dads to play with it! The Toy Fair also unveiled new Dr Who toys from the forthcoming 2012 series, so if you want to see them, be aware this page is a potential spoiler alert!! Here are the top 10 boys toys for 2012; use the red links below to Compare Prices links from Toys R Us, Argos, Play.com and other well-known UK online toy shops.